Republicans have long dreamed of destroying the social safety net once and for all. To which I’d add, not only the worst legislation, but also the most radically transformative passed in our lifetimes. The bill seems to have something to hurt every American, except for the wealthy. It raises taxes on most middle-income wage earners over the long haul, eliminates the individual mandate for health care (which will send insurance premiums soaring) and allows oil drilling in the Arctic National Wildlife Refuge. The House version removes deductions for large health care expenses and compels graduate students to pay taxes on tuition waivers, though the Senate version retains both. Speaking of the health care provisions alone, former Treasury Secretary Lawrence Summers predicted millions would die. But to be perfectly honest, bad as they are — and they are very bad — these aren’t likely to be the worst problems with this patchwork legislation. Though it was seemingly thrown together at the last minute, with senators scribbling changes in the margins even as it was being debated on the floor, and though it was concocted solely to give the Republicans and their monster-in-chief a legislative victory — any legislative victory — it would be misguided to think that there isn’t some grand scheme behind it. In fact, for all the haphazardness, the tax reform measures passed by the House and Senate, which must be reconciled in conference before final passage, achieve a deliberate and much-cherished GOP goal that supersedes short-term victory. Republicans have long dreamed of destroying the social safety net once and for all. This is the bill that finally threatens to accomplish their plan. The New Deal, which created that safety net, arose in the Great Depression precisely because the free markets that Republicans insist to this day are the answer to every problem failed Americans miserably. Government was needed to bail them out then and to protect them in the future. New Dealism was a set of programs — Social Security, public works, fair labor laws, conservation and dozens more — but it was also an attitude about government and the role it could and should play, from actively helping citizens in distress to equalizing an unfair tax structure. The proof of its success is that Republicans didn’t dare revoke it when they came back to power. Frankly, they couldn’t, because New Dealism was too popular for them to do so. Dwight Eisenhower didn’t even reduce the highest marginal tax rate of the 1950s, which sat at 91 percent. And believe it or not, no one outside of right-wing extremists called him a socialist. Still, there were elements of the Republican Party that chafed over New Dealism and never gave up hope of rescinding it and returning America to its primordial state — when the wealthy controlled everything and ordinary people were left to fend for themselves. The Republicans, a coalition of big business, farmers and small-town Rotarians, hadn’t been the party of the people for a long time. The GOP’s two deepest strains may have been personal responsibility and Social Darwinism, and neither was especially hospitable to government intervention of any sort. In combination, these beliefs challenged the very foundations of New Dealism, assuming not that government was a collective instrument to help Americans when they needed it, but that government assistance subverted self-sufficiency and undermined the natural order of things: the poor were poor and the rich were rich because they deserved it. This was by no means the entirety of the Republican Party. Though it is impossible to imagine right now, there was a progressive wing of the party with stalwarts like Robert La Follette, George Norris and William Borah. And there were moderates who, while favoring Wall Street, didn’t abhor all government involvement in the economy. With this concession, New Dealism not only endured the griping against it, but, during Lyndon Johnson’s Great Society, grew — with Medicare and Medicaid signal achievements. By necessity, even Richard Nixon was a sort of New Dealer, introducing the Environmental Protection Agency and the Occupational Safety and Health Administration. 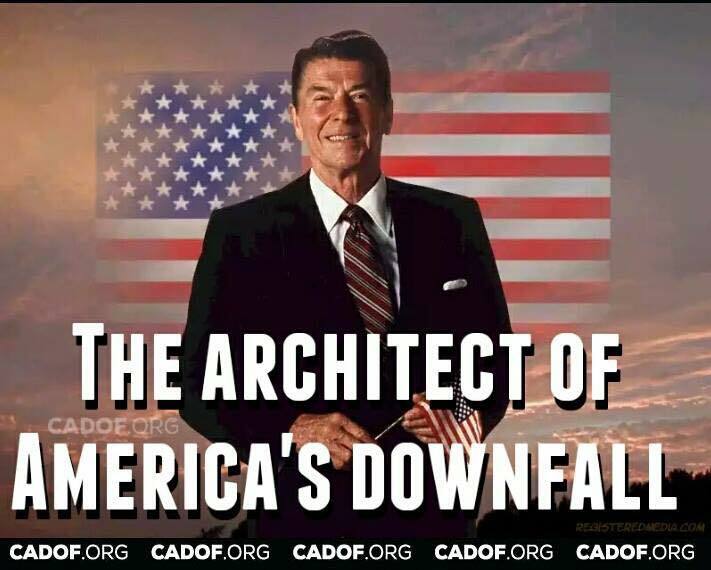 That’s the way it was throughout the postwar period — until Ronald Reagan. Of the many ways Reagan changed American politics, among the most important was taking the extreme right-wing factions of conservatism who had been knocking at the party’s door and letting them in. This was a sneaky trick and a cataclysmic one that eventually would lead to Donald Trump. Inevitably, New Dealism and Republicanism cannot coexist, because New Dealism is about helping people and Republicanism is about insisting that people can only help themselves. There is not a shred of empathy in the latter. And therein lies the real driving force and the grand strategy behind this so-called tax reform. The House and Senate bills will both increase the deficit — the deficit about which Republicans have caterwauled for 50 years — by more than one trillion dollars! But rather than admit such rank hypocrisy, they deny that a trillion dollars will actually be added to be the deficit. The biggest dissemblers say that the resulting economic growth from tax cuts will take care of it, which is utter nonsense. The less egregious liars say that they will raise taxes if the deficit balloons, which is also nonsense. But — and here is the fine print — they say that if necessary they will cut government programs to keep the deficit under control. That is the basic point. The object of tax reform is to create a gigantic deficit to justify ending the New Deal. The time will come, and it is not far off, when every New Deal and Great Society program will be on the chopping block. And when they are, Republicans will start their deficit hawk mating call again. And because the deficit will have swelled so much, programs will be slashed. They won’t just nibble away at the edges. They will try to kill the whole thing. Democrats will protest. They may even be in power. But if they are, they will be handed an untenable situation, having to choose between deficits and programs. In effect, Democrats are being set up. You can already hear Republicans saying we can’t afford Medicare, Medicaid, food stamps or even Social Security. It is government as cruelty. In the past, when it came to New Dealism, Republicans always had to hide their true intentions because when they dared reveal them, as George W. Bush did when he sought to privatize Social Security, the hue and cry was deafening. In fact, a few weeks ago I wrote about how Americans were wising up, and it’s true that the more they learn about this “tax reform,” the more opposed they are. Right now, the opposition is overwhelming. But with Donald Trump in charge, Republicans feel no need to conceal. They have been emboldened, I think, to show their true selves because they feel Trump has their back with his supporters — and as long as they have that army behind them, they are willing to take the risk of promoting a “reform” nearly everyone else hates. Those aggrieved white men who form the bulk of rank-and-file Republicanism don’t care if they have to pay more taxes. They don’t care if premitheir health insurance premiums soar. They don’t care if their children can’t afford to go to college. Surveys show that they are more devoted to Trump than to their own welfare, and they will follow Trump wherever he leads, even if he leads them to financial disaster. He voices their hatreds, and hatred trumps policy. Such is modern Republicanism. In a way, you can’t blame Republican office holders for being fired up. They have the New Deal in their sights, and they are eager to pull the trigger. Yet this country already has suffered grievously from Republicanism and Trumpism. It has lost its moral compass, and is about to put an alleged child molester in the Senate. America is going to suffer a great deal more once the deficit reckoning comes and the great unraveling begins. When the social safety net is gone, what happens to those who fall — which in truth, could be every single one of us? Neal Gabler is the author of five books and the recipient of two LA TImes Book Prizes, Time magazine’s non-fiction book of the year, and USA Today’s biography of the year. He is a senior fellow at the Lear Center for the Study of Entertainment and Society.